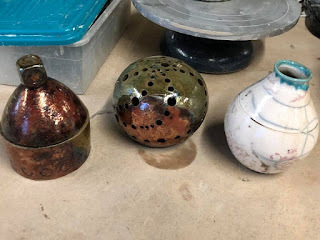 Fine Mess Pottery: 'Tis the Season - for Raku! 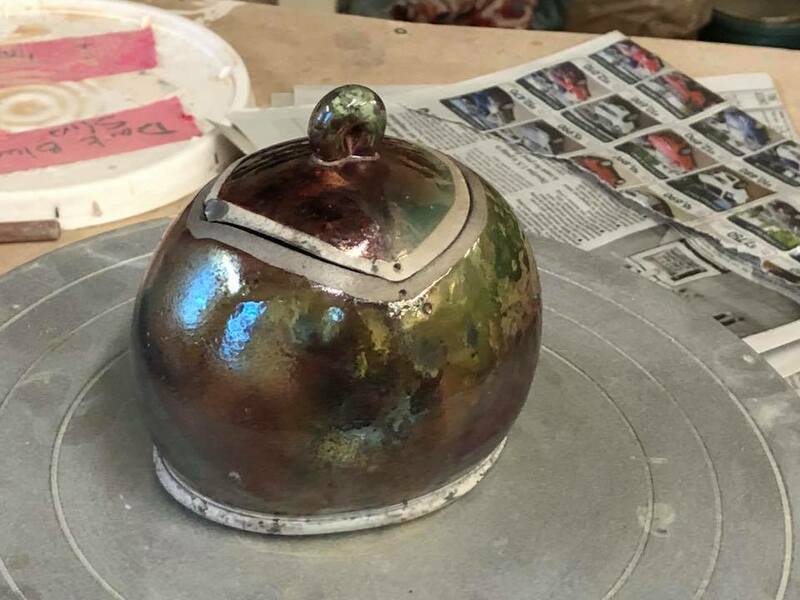 'Tis the Season - for Raku! 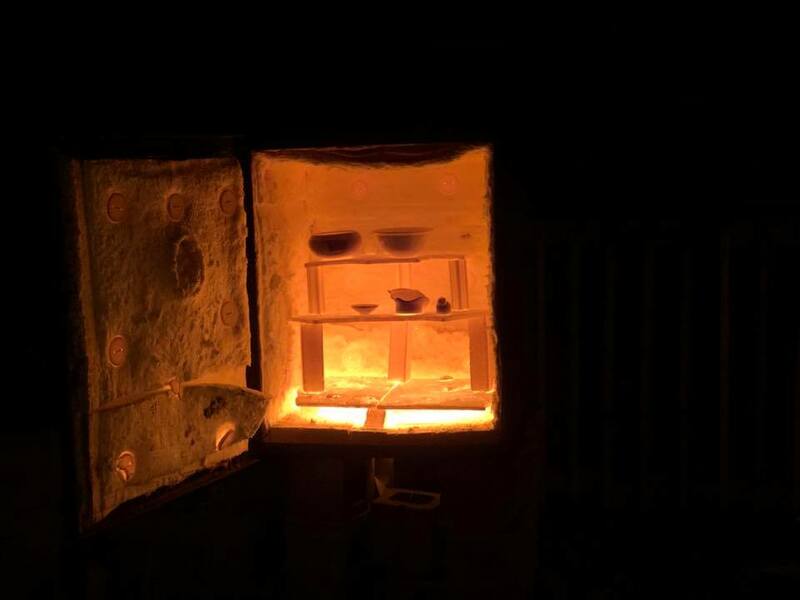 I never tire of glowy-kiln images! 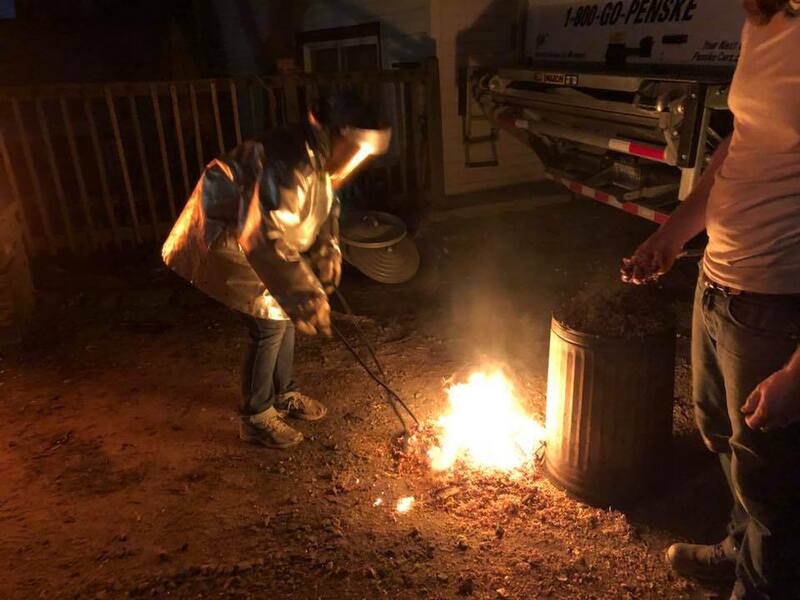 I am always the one with the tongs, so not in position to appreciate the visual spectacle while it is happening; I'm busy making sure all the pots survive the journey & no one gets burned. That's me, there, in the silver jacket & face shield. 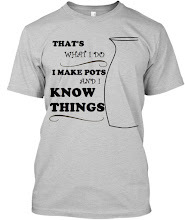 I know lots of people who raku without all the protective gear, and I will never be one of them! Just call me snowflake, I see no reason to be in pain if it can easily be avoided. The photo above was taken after about half the pots were out. We got some lovely pots out of the firing! I find I get better results if I don't try to cram as many pots as possible into the kiln: fewer pots means I don't have to hurry before the last ones cool off. I can take my time & position the pieces in the sawdust in a way that will benefit them, instead of just however they land. For example, bowls should be place rim down in the combustible pile! Copper lustres will turn bright & metallic, and all glazes will avoid the unfortunate crusty texture that comes with getting sawdust (or dry leaves or newspaper or whatever) in the puddle of still-molten glaze inside a bowl. Here are a few results, with thanks to Holly Johnson of Hurricane Mountain Pottery for all the photos I used today. We use little garbage cans with lids to give a bit of reduction on the shredded newspapers, pine straw or whatever...I love raku'ing but it's hard to bring all the stuff out (kiln, gas cylinder, etc) but oh so worth it when it happens...I sign up for rake workshops whenever I hear about them. 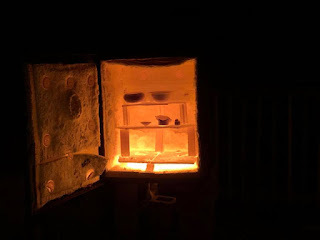 What Do You Do While the Kiln is Firing?